Published: Dec. 9, 2012 at 04:25 p.m. Updated: Dec. 9, 2012 at 06:46 p.m.
Everything seemed to be stacked in the Pittsburgh Steelers' favor Sunday. 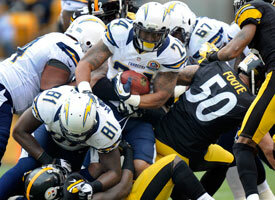 Check out the best photos from the Week 14 matchup between the Chargers and Steelers. They were confident, coming off a monster win in Baltimore. Even better, Ben Roethlisberger was back in the lineup after missing three weeks with rib and shoulder injuries. With a home matchup against the fading San Diego Chargers on tap, the Steelers seemed destined to solidify their playoff standing. Naturally, the Steelers went out and laid an egg in a 34-24 loss. It's a damaging setback for the Steelers, who kicked away a chance to take sole possession of the AFC's sixth and final playoff seed. At 7-6, they remain tied with the Cincinnati Bengals, who blew their own golden opportunity Sunday in a last-second loss to the Dallas Cowboys. If there was any good news for the Steelers, it was Roethlisberger. The quarterback looked healthy in his return to action, finishing 23-of-43 passing for 285 yards and three touchdowns with one interception. Two scores went to Steelers wide receiver Mike Wallace, a forgotten man in the lineup during Big Ben's absence. Roethlisberger moved well and appeared to shake off contact in the pocket. He didn't consistently move the offense until the game already was decided, but he appeared to make it through without any issues. That's big for Pittsburgh. The Steelers' remaining schedule is manageable -- but not easy. They head to Dallas next week in a game that could eliminate the loser from playoff contention. The Steelers close with home games against the Bengals and Cleveland Browns, two AFC North rivals who'd love to take credit for a dark January at Heinz Field.